Good morning! From July 28 until July 29, there have been 24 new positions posted on the ACS Careers website. Of those, 4 positions are academically connected (17%) and 1 position is from Kelly Scientific Resources. Pfositions at Pfearl River: Pfizer is hiring 4 M.S./Ph.D chemists at the old Wyeth site for "scientists with experience in synthetic/semi-synthetic organic/medicinal chemistry of glycoconjugates, carbohydrates, peptides, protein modification, bioconjugation to work in the area of conjugate vaccine research and early phase development." Paper! : Sappi Fine Paper is searching for a M.S./Ph.D. research scientist to perform research on coated papers in Westbrook, Maine. Education in "organic chemistry, polymer chemistry, or material science" is desired. Water! : The Las Vegas Valley Water District is hiring a Ph.D. chemist to head research "related to the quality of water treated and distributed by the Southern Nevada Water Authority/Southern Nevada Water System." Good luck with that; the Colorado River isn't exactly getting higher. Ink! : E Ink is looking for a Ph.D. synthetic chemist (0-8 years experience) for work on new organic materials for electronic paper displays. So as I was sayin', part N.: IMRA America in Ann Arbor, MI is looking for a M.S. materials chemist to work on a lithium ion battery. Seems to me that people have a difficult time finding work in chemistry in the UK; that Trevor Laird editorial is sure indicative, and I think I've seen other signs. Anyone want to tell me about the history of it (maybe the last ten years?) Give me a buzz at chemjobber -at- gmaildotcom or throw in a comment. In April of this year, Derek Lowe made a statement that I found interesting, but not proven: "there are far fewer med-chem jobs out there today than there were five years ago." Later in the post, Dr. Lowe tends to define the term by "the number of well-paid US-based positions at large pharma companies." For the most part, I think he's right. The list of former large pharma sites listed by one of my commenters recently is too large to list and too large to ignore -- not all of those positions could have been resorbed by their parent/merged companies. However, I have been unable to locate a census-type count of industrial medicinal chemists; to my eye, this would be the only way of falsifying Derek's hypothesis. II. Now is not good. "The impending closure of GlaxoSmithKline (GSK) sites in the UK and Italy, and the announcement by Astra Zeneca of the closure of the Loughborough (Charnwood) site with the loss of 1200 R&D staff along with the loss of jobs at the Avonmouth manufacturing site mean that many scientists in process R&D in the UK are falling on hard times. At the same time, Pfizer has cut staff in Medicinal Chemistry and Process R&D at Sandwich, UK, after the merger with Wyeth and has reduced the number of manufacturing sites in Ireland and elsewhere. So in the UK, the three major companies carrying out medicinal chemistry and process R&D are all reducing staffing levels. Now, where do those out of work, or for that matter new recruits from universities, find jobs? I wish I knew the answer!... In the United States I am sure the situation is no better with many major multinationals announcing layoffs in the last year, and even the biotech sector is not immune to similar problems." His advice to his colleagues? Find a CRO position or a job with a private pharmaceutical concern that isn't affected by all the merger-mania and keep networking. Good advice, but (as he would likely admit) there's not a lot of positions there, especially in the Western half of the world. "Almost every industrial chemist I know who has been laid off remains unemployed. I am in the biotech/pharma industry and know of hundreds of synthetic chemists who have lost their jobs as pharma/biotech/ag/chemical industry has moved jobs off shore/downsized and as biotech companies focused their little remaining money on clinical development. The real question is: what is the unemployment rate of industrial chemists who did medicinal, synthetic, and other laboratory-based organic chemistry work? If you were highly trained as a medicinal/synthetic or other organic specialty, you are not likely to move into green inorganic material science without going back to graduate school. Unless I am missing something, I do not see our industrial jobs ever coming back, so a whole generation of organic chemists will be lost, thrown out like so much useless trash. The profession will wither away outside of academic departments." Derek Lowe tends to agree in his April post: "I hate to sound like this, but I think there's been too much of a shift in recent years for anything to undo it. Costs have gone up, drug-development success rates have (at best) not increased, and there are cheaper ways to get a good amount of work done which used to cost more. Which of these things are going to change back, and how?" IV. What does this mean? I don't know -- nothing good, I suspect. Over the next year, I plan to try to figure it out. I hope you'll help me. Good morning! Between July 14 and July 27, there were 90 new positions posted on the ACS Careers website. Of those, 25 (28%) are academically connected and 1 is from our friends at Kelly Scientific Resources. Awesome: Look, this is an awesome job for someone. Dugway Proving Ground (through Jacobs Technology) is looking for a M.S. analytical chemist to perform GC- and LC/MS on chemical warfare agents and their degradants. One of you has got to apply for this thing. As he was saying: PPG Industries is looking for Ph.D. organic/polymer chemists; 0-2 years of experience is desired. As I was saying: GE is looking for a Ph.D. electrochemist with experience in organic and materials chemistry for advanced battery technology. Be Barry's boss: The Scripps Research Institute is looking for a president; you just need to have "national and international reputation as a scientist in any of the key TSRI disciplines such as structural biology, chemistry, cell biology, etc." and "a record of progressively responsible management of programs of considerable scale and complexity." Looks like you'd be Bill Roush's boss, too. Fenton Heirtzler is a frequent commenter on Chemjobber; he is currently looking for a position in chemistry. Recently, I asked him a series of questions on his job hunt. This e-mail exchange has been lightly edited and checked for accuracy by Dr. Heirtzler. CJ: How long have you been looking for work? Fenton: Until 2003, I was faculty at a university in England, which closed its chemistry program. So I returned to North America, and post-doc’ed for four years while applying for faculty jobs over here. For the past three years, I've also been applying for industry jobs. In the summer of 2009, I had a three-month appointment as 'Visiting Scientist' at Brookhaven National Laboratory. That is a really great place for science geeks to work. CJ: If you were to estimate the number of positions that you’ve applied for, what would that number be? FH: This year, I've been busy with an adjunct position at a university in central/southern New Jersey, where I'm also allowed to do my own research (volunteer basis) on a shoe string budget. So I've been applying for fewer positions in 2010 (there have also been fewer ones which are appropriate). For 2010, the totals are: industry: 9; academia: 9. For 2009, from September to December I applied for 119 positions at companies and 28 with universities (of which some were abroad). Most recently, I've been inquiring with academic polymer scientists and engineers about temporary positions to retrain in that field. CJ: How many interviews have you received? FH: Beyond the aforementioned period of time, I have had maybe four interviews with companies - but none since September 2009. From this year's applications for faculty jobs, there was one interview in April. Over the past three years, I've had six university interviews. Two interviews with government or military laboratories, but the positions were cut. CJ: What emotions go through your head when you think about getting work? FH: Anger. Depression. Frustration. Indignation that all the talk by Obama about "new jobs" and "science" does not include New Science Jobs. "Could have - should have - would have". CJ: You mention age discrimination as something that you're concerned about. I have a feeling this is something that some of my readers are concerned about and that all of my readers may face at some point. Can you elaborate a little more about your concerns? FH: Post-doc positions are slanted so that salaries for those who are more than five years beyond their doctoral degrees are too expensive for the P.I. to afford. I have even heard from faculty at Ivy League universities that this policy "prevents exploitation" (huh?). Also, DOE laboratories (e.g., NREL, Sandia, PNW National Laboratory, Brookhaven and Lawrence Berkeley) refuse to appoint as post-docs those who are more than five years beyond their doctoral degrees. Of course, who wants to become a professional post-doc? Nevertheless, this is closing the door on a major re-training opportunity for US scientists. In spite of the occasional person who completes their doctorate at a later age, this policy still overwhelmingly amounts to age discrimination. Finally, NUMEROUS advertisements for industrial positions stipulate that only RECENT PhDs are welcome. CJ: Can you describe the day-to-day process of “getting by” financially? What has been the most telling part? CJ: How long will you keep looking for work in chemistry before you consider another field? FH: Good question - the only retraining option that gets a lot of coverage is becoming a schoolteacher. Teaching without research I find to be intellectually repugnant. There should be other options for retraining those with advanced science degrees . But I love Chemistry. CJ here again. Thanks to Dr. Heirtzler for the interview and best of luck with finding a position in these tough times. Leigh Boerner is the writer behind Just Another Electron Pusher, C&ENtral Science’s in-house jobs and employment blog. When she’s not a blogger, she’s a doctoral candidate in synthetic inorganic chemistry at Indiana University - Bloomington. I caught up with Leigh over IM and via e-mail over the past week; the following is a lightly edited version of our electronic conversation about science writing and her search for employment. Leigh: They end up in a lot of places. A lot of people from my department have gone to either 3M or what used to be GE Plastics (now Saibic Innovative Plastics), which both recruit pretty heavily here. I had a colleague go to BASF which is essentially the 3M of Germany (he works on adhesives, I believe). Eli Lilly, which is just up the road, also hires a lot of organometallic chemists. (Well, they used to.) Synthetic inorganic chemistry is actually pretty dang versatile, since we tend to do both organic synthesis and work with air-sensitive metals, so we generally know dry-box and Schlenk techniques. We gots the skillz. I actually do quite a bit of organic work myself, since I make porphyrins. But since they're so photo-active, I know a lot of photochemistry and things of that ilk, too. When I started grad school, I ultimately wanted to do solar energy research for the DOE, and there was a girl here a while back that did get a job at a DOE lab in Colorado. So yeah, lots of options. CJ: So are you thinking about science writing or something else? If you're a beginning science writer, what's the outlook for you -- are you going to be doing a lot of freelancing? Leigh: Science writing, definitely. About 25% of me is also maybe thinking publishing.... I've been doing some freelancing. I turned in a story for a university mag yesterday. I've written for Science and The Scientist a bit. And I have tons of ideas, but it's just a matter of finding the time to write pitches to magazines, etc. CJ: Do you think science writing is going to more or less lucrative than being a graduate student? I don't know the first thing about how much a science writer makes. Leigh: Pretty much everything's more lucrative than being a grad student... It depends on where you work. When I interned at the OC Register, through AAAS, I made about the same each month as I do as a grad student. So that was an internship -- I would say about twice as much, for a beginning writer at a middlish paying type place. CJ: What was it like working at the OC Register? What are the differences in mindset between a grad student and a reporter? Any insights you think chemists could gain from the media? Leigh: It was a lot of fun, but also a lot of hard work. I remember constantly missing the turn to get back to my apartment because I was so mentally exhausted every night. Things moved very fast, and I had to just kind of jump in and get my stories written, even though I felt like I didn't know what the heck I was doing much of the time. My editor was very much of the "throw them into the deep end of the pool" philosophy of teaching, and he was constantly putting me in tough situations to see how I would deal with them. The first interview I did on my own was like that. My editor and I were at UC Irvine, and had two interviews set up while we were there. The first one was fine, and my editor did most of the talking. On our way to the second one, he was kind of prepping me up for it, and said that the psychology prof we were going to talk to was notoriously hard to interview, because she never really spoke in plain English. And then he said, "but you're going to do it on your own cuz I've gotta go, bye!" And he was GONE. I stood stunned for a few minutes, and then dragged myself to her office and did the interview. And it actually turned out not so bad. Working at the OC Register was also probably the polar opposite of being a grad student. Things always started slow in the morning, but got crazy in the late afternoon/early evening. And the week started out mellow, but got insane towards the weekend. I guess the biggest difference was how you're supposed to impart information. In journalism, the simplest way of stating things is always the best. But in science, generally the more jargon you use, the better. I'm forever irritating my adviser because my way of talking is not "scientific" enough. But my editor at the OC Register was always scolding me for "talking like a scientist." Writing and grad school are similar in the fact that for both, you have to have a really thick skin. I remember my editor saying to me at one point, "You take criticism really well." When I told my adviser that, he laughed and said, "See? Don't say I never did anything for you." CJ: Who do you read in the chemistry blogosphere? What would you like to see more? Do you have writerly inspirations? Leigh: I read all the C&E News blogs of course, and yours, the Chemistry Blog, In the Pipeline, and the Skeptical Chymist. Aaaand that's about it. There aren't too many out there, sadly. I do miss The Chem Blog, and I would really like to see some more pop up like that, meaning ones that can really analyze papers well, but also have a sense of humor. And I think we need more chemistry blogs that speak on a lay-person's level, without being condescending. People do think chemistry is really cool, but I think are put off by the jargon. I think a very well-explained blog about chemistry background and current research would be a fabulous addition to ye olde blogosphere. I do have writerly aspirations. My ideal job would be to write a column about general cool science things (but mostly chemistry) that would give me a reason to still play with chemicals. Have you ever heard of Harold McGee? He's a food writer for the New York Times, and also the author of a few books, e.g. On Food and Cooking and The Curious Cook. In the latter, he actually goes into the lab and tries to figure out things like why egg whites get more foamy when you beat them in copper bowls. It turns out egg whites get kind of gluey sometimes because they're made up of a lot of cysteine, which contains sulfur. These form disulfide linkages, which kind of weigh the egg whites down, and make them more dense. But when you put them in a Cu bowl, the S tend to bind to the Cu instead of each other, which means they get really aerated and floofy and delicious for baking! The same thing happens if you add a drop or two of an acid, like vinegar or lemon juice. Neat huh? Anyway, my point (and I do have one) is that I want to write stuff like that. Not about food, but about questions like, "why does X do Y?" Then be able to go in the lab and play and figure it out. Then write about it. Once upon a time, I did kind of do that. I had a science column in my university paper called "Ask Suzie Q. Scientist." Unfortunately it didn't last long, because the paper discontinued the Health & Science section shortly after I started the column. But for one of them, I did get to talk about embalming and what it does. Then I shot some formaldehyde into raw chicken, just to see what it did (after sitting for a bit, it bounced like a super ball). Now if I can just find someone to pay me for doing stuff like that, I would be a happy chemist. I'd also like to write books. I have about six in my head, and I think they need to come out. CJ: What's your non-chemistry media diet? Any papers or blogs that you particularly like? Leigh: I read my local paper every day, which tends to surprise my grad school colleagues. I also am a bit of an NPR junkie, and listen to All Things Considered and Morning Edition every day. And RadioLab, whenever a new one comes out (I am a RadioLab FIEND), and I catch Science Friday when I can. I read the New York Times, not every day but a couple times a week (esp Tuesdays, because that's when The Science Times comes out). I also read Science, Nature, New Scientist, Wired, Science News, Scientific American, and a whole slew of other science type magazines. I do also read a lot of general science blogs, like The Loom (Carl Zimmer), Not Exactly Rocket Science (Ed Yong), You Are Not So Smart (David McRaney), Neurotopia (Scicurious, although that's neuroscience, not general), and others too numerous to mention. CJ here again. Thanks to Leigh for the interview and go on over and enjoy Leigh's blog! Good morning! Between July 9 and July 13, there were 16 new positions posted on the ACS Careers website. Of these, 8 (50%) are academically connected. Foam, my boy, foam: Rynel is looking for a M.S./Ph.D. chemist for R&D at their Wiscasset, Maine facility - sounds like you'll get regular phone calls and/or trips to Sweden, too! Hmmm: Beta Pharma is looking for Ph.D. organic chemists with 5+ years experience for (I suspect) their New Haven, CT facility. Sun and sand and...: CP Kelco is looking for a B.S./M.S. analytical chemist "to discover, conceive and develop new ideas, chemicals and systems for use in food, industrial and personal care applications... Expertise in food, nutrition and/or industrial application formulation in addition to the physical chemistry of biopolymers is a plus." Bay area: Theravance is looking for a B.S./M.S. synthetic chemist with 1 to 5 years of experience. Good luck! Perhaps it's unsurprising, but it's one of those things worth remembering. After graduating, you have about 10 to 20 years to work before the Turk might come and ask you to turn in your playbook. - B.S./M.S./Ph.D. unemployment, respectively: 5.6%, 4.2%, 3.3%. Really? I would have expected the completely opposite trend. - A bad, bad trend: the highest age decade for postdocs? The thirties, with 7.5% postdocs. 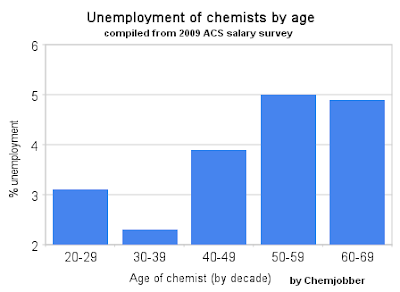 Chemists aged 20-29 are at 5.9%. This level of instability in the numbers suggests that there's something funny about that set of numbers. I dunno -- it just looks weird. - The U3-like measurement of chemist unemployment is at 3.9%, which is the highest it's been in twenty years. - Median chemist salaries fell 3.2%. That's not good, either. I'll note that my bold prediction of last year came out to be a bit pessimistic ("U3" = 5%, "U6" = 12%). I'm happy to have been wrong. More later, after I've had a chance to digest this. What's the 'funding line' for a Big Pharma senior scientist these days? I suspect that the career fair at the upcoming ACS Meeting in Boston will be a zoo, regardless of job speciality (Pharma, Environmental, QA/QC). As if Boston weren't already a competitive job market for organic chemists, every grad student or postdoc from "top-tier" groups will probably be scheming to get positions that are suited for those with just the right amount of industrial experience. Any thoughts on what would be an "ideal" candidate for an entry-level position in MedChem or Process? Academic readers will be familiar with the concept of the ever-rising "funding line" or "pay line" for grants submitted to NIH. What is the equivalent expectation for Big Pharma these days? 1. most or all obtained their doctorates at very prominent universities from "name" professors. 2. over 75% had postdoctoral fellowships, again at very prominent universities or institutes. 3. the median CV probably had more than 6 publications during their academic training. Readers in the know, what do you think? Good morning. From July 6 to July 8, 15 new positions have been posted to the ACS Careers website. Of those, 4 (27%) are academically connected and 1 is from our friends at Kelly Scientific Consulting. Mysterious? : Amyris Biotechnology is looking for a Ph.D. organic chemist for work in scale up in their process department. Why a biofuels company desires someone skilled in natural product synthesis is kind of beyond me. Find the hidden aliens, too! : UES, Inc. is looking for a Ph.D. materials scientist for a postdoctoral position in organic and nanostructured electronic devices. Matsci FTW: Brewer Science, Inc. ("a leading supplier of specialty coatings to the microelectronics industry") is searching for 3 positions: process engineer, senior research associate and project leader. Sounds interesting and these aren't the first positions they've posted this year. Well, that's inconvenient: DuPont's Discovery Knowledge Center is looking for Ph.D. organic chemists (1-5 yrs. experience). The positions are in Hyderabad, India and you "must have legal right to work in India." Huh. Well! : It's the first one-pager in a while, with Genentech coming in strong with one of their old "BECAUSE" ads. Gilead and Grace post a nice set of positions, too. Good luck with that: Novartis is looking for a senior EH&S manager for their Shanghai, China site. Not to get too overly cynical, but can you imagine what that job's going to be like? You're basically going to be the senior EH&S manager in China for Novartis, too. Um, no thanks. I don't believe you: Gilead's rather lovely ad has the tagline "Careers for Life." Well, yes, but, well, no, I think you're trying to fool me. So as I was sayin': W.R. Grace is looking for a R&D scientist in their batteries program. Desired traits? Ph.D. with 1 to 5 years experience in inorganic chemistry with battery experience. Small college of the week: Southern Connecticut State University (New Haven, CT, student population: 7002 - SA-LUTE!) is looking for an assistant professor for physical chemistry. So if you want to be a professor at the other school in town (which has some serious football alumni! ), this might be the job for you! Good morning! There are 129 new positions posted on the ACS Careers website from June 11 to July 4, 2010. Of these, 51 (40%) are academically related and 1 is from our friends at Kelly Scientific. Gone for a while: So the DPT wasn't around for a while. Not a ton of big company positions, but Sigma-Aldrich is hiring and lots of smallish, non-pharmaceutical companies. Sounds like a good start. Batteries, batteries: If I could go back in time to get myself a job right now, I would turn myself into an Ph.D. organic or organometallic chemist who also did lots of electrochemistry research. If I had a nickel for every small battery-tech company that was looking for a synthetic chemist, I'd have at least one more: Pellion Technologies is looking for one with 3-5 years of experience. Just in time for Independence Day: The US Army's Picatinny Arsenal is looking for a chemist to "to conduct research and development on pyrotechnic devices, pyrotechnic formulations, and material characterization." Huh -- sounds like fun. A hot (and exotic! tropical!) postdoc: The US Department of Agriculture is looking for a Ph.D. chemist to perform analysis of biofuel quality on feedstock crops at their facility in Hilo, Hawaii. Enjoy! Good morning! These numbers are about 7 minutes old, so bear with me as I don't have the analysis down pat yet. The official unemployment rate (U3) went slightly down in June to 9.5% from May's 9.7%. The broadest measurement of unemployment, U6, also went down to 16.5% from May's 16.6%. 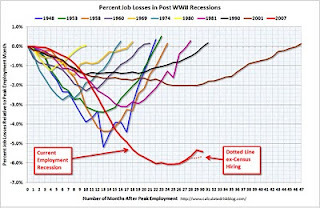 While these numbers are not bad, I am going to guess that they have more to do with dropping labor force participation rather than increasing payroll numbers. Speaking of which, private sector payrolls increased by 83,000 in June, which was lower than the 100,000 jobs expected by analysts. UPDATE 1: Private non-farm payrolls increased by 125k. Thanks to Calculated Risk for the graph. UPDATE 2: Okay, let's try that again. Private non-farm payrolls decreased by 125k in June. 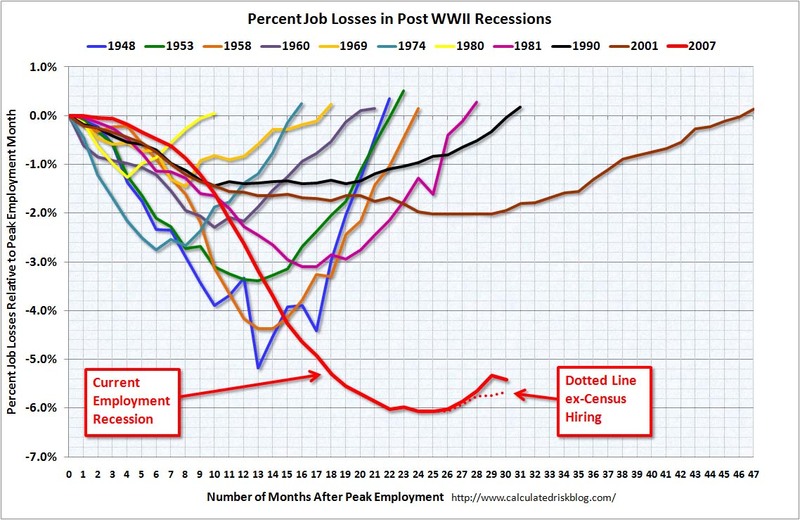 To quote from the BLS press release: "The decline in payroll employment reflected a decrease (-225,000) in the number of temporary employees working on Census 2010." All in all, things aren't really looking so good and there aren't a ton of bright spots out there. Sigh.